Just one mile west of Canyonville, nestled in southern Douglas County, lies a community forest like no other. Alder Creek Community Forest boasts 78 acres of forested serenity. With 3.5 miles of signed hiking trails, visitors can experience a verdant drainage in a fern draw, the forest logging history along Big Stump Trail, the incense-cedars and black oaks of the mixed forest, a one-of-a-kind view of Canyon Mountain from a meadow, and the bigleaf maples of Alder Creek. Alder Creek has something for everyone to discover. They welcome youth and lifelong learners. Programs for K-12 bring students an opportunity to explore and learn about natural resources through project-based science, geography and forest ecology, including wildlife identification, Landsat measurement, interpretive trails and stream flow data analysis. Interpretive trail signs highlight points of interest and even provide puzzles for visitors to solve. Working with the Southern Oregon Land Conservancy allows the Alder Creek Community to conserve their property in perpetuity. It is a way for the Proctor family to give back to the community and protect a legacy of land management that exemplifies the history and beauty of Southern Oregon. Robert and Virginia Proctor were active community members and educators in Canyonville for more than 50 years. Both held a strong passion for their forest and its management and preservation. Carrying on his parents legacy, their son Jim founded the Alder Creek Children’s Forest in 2002 and with SOLC, he permanently conserved the 50-acre property with a conservation easement. In 2003 the Children’s Forest was expanded to 78 acres. In 2010 the name was changed to the Alder Creek Community Forest to reflect a broader vision and service. Today, Alder Creek educates students and trains teachers across Douglas County through a variety of in-school and Alder Creek on-site activities, and they host visitors throughout the year. 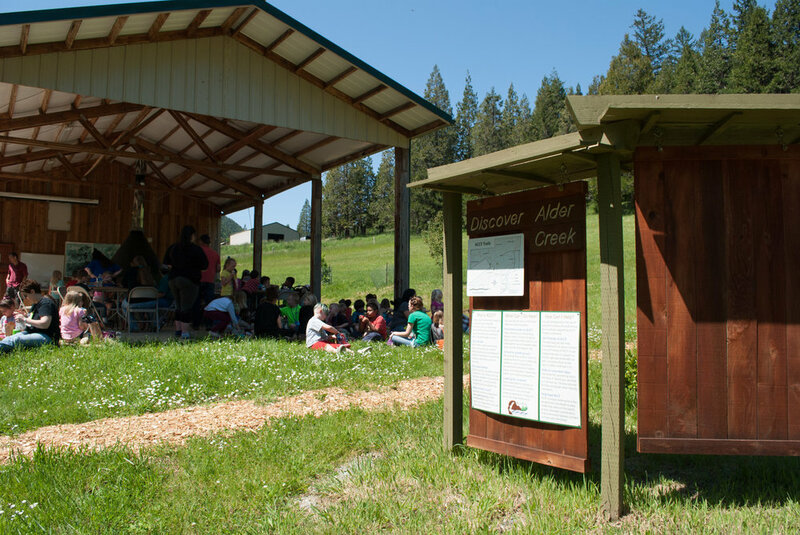 Alder Creek Community Forest’s mission is to create a safe place for exploring the outdoors, for lifelong learning and for dialogue to address challenges in sustaining forests, watersheds and communities. Please note this property is privately conserved and not currently open to the public. They plan to reopen for visitors in Spring 2019. Check their website for updated visiting information.